Since 1995, the number of independent organic food processing companies in the U.S. has been cut down from 81 to 15. Today, almost all of the organic food on our shelves is produced by a handful of multinational corporations like Coca-Cola, Campbell Soup Co. and ConAgra. Agriculture business researcher Dr. Philip Howard, an associate professor in the Department of Community Sustainability at Michigan State, has been tracking the corporate takeover of mid-size organic food processing companies for years. 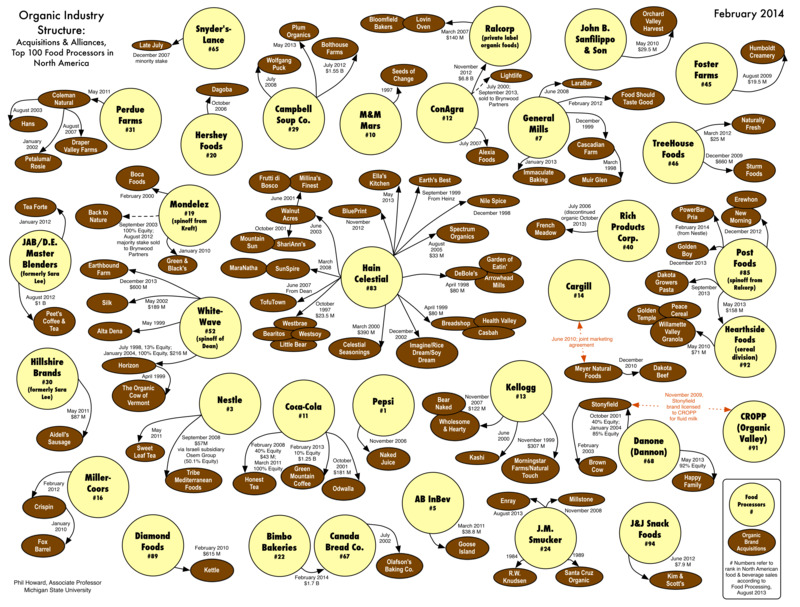 In this stunning graphic, updated in February 2014, Howard shows just how concentrated organic food business has become. The brown circles are organic brands that have merged or been acquired, while the yellow circles are the food processors that bought them out. The number in the yellow circles refer to the company&apos;s rank in North American food and beverage sales. Some of the major corporations include Pepsi (which owns Naked Juice), J&J Snack Foods, Nestle, Hillshire Brands (formerly Sara Lee), ConAgra, Coca-Cola and Miller-Coors. Independent producers getting bought out doesn&apos;t just change the name of the product&apos;s parent company. According to Dr. Howard, it changes the food&apos;s quality as well — often for the worse. "It&apos;s very common that when an organic food brand is acquired, that the new parent corporation reduces its commitment to organic ingredients and seeks out cheaper substitutes," Howard told Forbes. "Examples include Odwalla after it was acquired by Coca-Cola, Silk Soymilk after it was acquired by Dean, and Peace Cereal after it was acquired by Hearthside Foods (now Post Foods). Consumers have to be vigilant about scanning the ingredient lists as a result." It also means that buying organic sends money to corporations that push for anti-environmental-activist goals. For instance, Coca-Cola (owner of Honest Tea and Odwalla) and General Mills (owner of LaraBar and Food Should Taste Good) each contributed more than a million dollars to oppose California&apos;s initiative to mandate GMO labeling. Luckily, with informative graphics like Dr. Howard&apos;s and scorecards from nonprofits like the Cornucopia Institute that rate organic brands of dairy, eggs, soy foods and breakfast cereals, consumers can find a way to keep eating real organic.